Artist's conception of our solar system's solar nebula, the cloud of gas and dust from which the planets formed. Earth and the other rocky planets aren't made out of the solar system's original starting material, two new studies reveal. Scientists examined solar particles snagged in space by NASA's Genesis probe, whose return capsule crash-landed on Earth in 2004. These salvaged samples show that the sun's basic building blocks differ significantly from those of Earth, the moon and other denizens of the inner solar system, researchers said. Nearly 4.6 billion years ago, the results suggest, some process altered many of the tiny pieces that eventually coalesced into the rocky planets, after the sun had already formed. The Genesis spacecraft launched in 2001 and set up shop about 900,000 miles (1.5 million kilometers) from Earth. It spent more than two years grabbing bits of the solar wind, the million-mph stream of charged particles blowing from the sun. The idea was to give scientists an in-depth look at the sun's composition, which in turn could help them better understand the formation and evolution of the solar system. To that end, Genesis sent its sample-loaded return capsule back to Earth in September 2004. But things didn't go well; the capsule's parachute failed to deploy, and it smashed into the Utah dirt at 190 mph (306 kph). While some of Genesis' samples were destroyed in the crash, others were salvageable, as the two new studies show. Two different research teams looked at the solar wind particles' oxygen and nitrogen — the most abundant elements found in Earth's crust and atmosphere, respectively. And they did so with a great deal of care, knowing that the crash had limited their supplies of pristine solar material. "The stakes were raised on the samples that did survive well," McKeegan told SPACE.com. "There wasn't as much to go around." The Genesis return capsule slammed into the Utah dirt at nearly 200 mph on Sept. 8, 2004 when its parachute failed to deploy. McKeegan and his team measured the abundance of solar wind oxygen isotopes. Isotopes are versions of an element that have different numbers of neutrons in their atomic nuclei. Oxygen has three stable isotopes: oxygen-16 (eight neutrons), oxygen-17 (nine neutrons) and oxygen-18 (ten neutrons). While scientists don't yet know for sure how this happened, they have some ideas. The leading contender, McKeegan said, may be a process called "isotopic self-shielding." 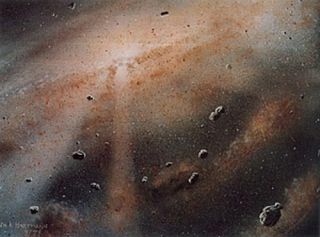 About 4.6 billion years ago, the planets had not yet coalesced out of the solar nebula, a thick cloud of dust and gas. Much of the oxygen in this cloud was probably bound up in gaseous carbon monoxide (CO) molecules. But the oxygen didn't stay bound up forever. High-energy ultraviolet light from the newly formed sun (or nearby stars) blasted into the cloud, breaking apart the CO. The liberated oxygen quickly glommed onto other atoms, forming molecues that eventually became the rocky building blocks of planets. Photons of slightly different energy were required to chop up the CO molecules, depending on which oxygen isotope they contained. Oxygen-16 is far more common than either of the other two, so there would have been much more of this substance throughout the solar nebula, researchers said. The result, the self-shielding theory goes, is that many of the photons needed to break up the oxygen-16 CO were "used up," or absorbed, on the edges of the solar nebula, leaving much of the stuff in the cloud's interior intact. By contrast, relatively more of the photons that could strip out oxygen-17 and oxygen-18 got through to the inner parts of the cloud, freeing these isotopes, which were eventually incorporated into the rocky planets. And that, according to the theory, is why the sun and Earth's oxygen isotope abundances are so different. "The result that we're publishing this week gives support to the self-shielding idea," McKeegan said. "But we don't know the answer yet." Marty and his colleagues found an even more dramatic difference than McKeegan's group did: The solar wind has about 40 percent less nitrogen-15 (compared to nitrogen-14) than do samples taken from Earth's atmosphere. Previous studies had hinted that the sun's nitrogen might be very different from that of Earth, Mars and other rocky bodies in the inner solar system, Marty said. But the new study establishes this firmly. "Before Genesis and the present measurement of the N isotopic composition of the solar wind and by extension of the sun, it was not possible to understand the logic of such variations," Marty told SPACE.com in an email interview. "Now we understand that the starting composition, the solar nebula, was poor in 15N, so that variations among solar system objects are the result of mixing with a 15N-rich end-member." As to how this enrichment of nitrogen-15 could have happened, Marty as well suggests some type of self-shielding as a possible mechanism. But it's not a certainty. "This is a scenario that is consistent with present-day observations," he said. "We cannot eliminate yet the possibility that these 15N-rich compounds were imported from outer space as dust in the solar system." The new results also suggest that most nanodiamonds — tiny carbon specks that are a major component of stardust — likely formed in our own solar system, because they share similar nitrogen isotope ratios with the sun. Some scientists have regarded nanodiamonds as being primarily presolar, thinking they were ejected from other stellar systems by supernova explosions. Both studies appear in the June 23 issue of the journal Science. The two new studies should help scientists get a better understanding of the solar system's early days, researchers said. And the results should help rehabilitate the reputation of the $264 million Genesis mission, showing that the capsule crash didn't render it a failure, McKeegan said. "We managed to accomplish all the science that we set out to do, all the important stuff," he said. "The enduring image in everybody's mind — the picture of the crashed spacecraft in the desert — will be more of a footnote instead of the primary thing that people remember. That's my hope, anyway."